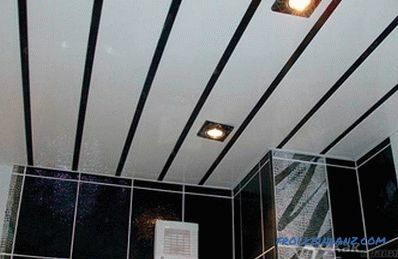 To begin with, how to make a suspended ceiling in the bathroom of the panels. There is nothing difficult. Why first consider panels and not drywall? Of course, you can make a false ceiling of plasterboard. First you need to bring the material on the truck, and then do the finishing - cover the seams and sheets with a grid, apply and level the filler, paint it. 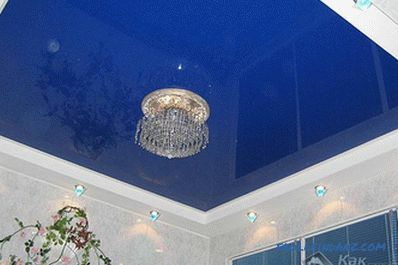 Of course, this ceiling will be beautiful, but, in general, plastic panels look great too. 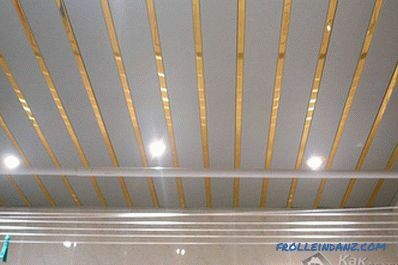 Moreover, not everyone can do the installation of the gypsum ceiling with their own hands, but it is easy to mount the panels. Next, we also consider the options for the ceiling and plasterboard. A little about The advantages of plastic on the ceiling. He is not afraid of moisture and water - and this is the main requirement that is imposed on the ceiling in rooms with high humidity. The same drywall for the ceiling should be purchased only if it is moisture resistant, and such a sheet will cost more than usual. In contrast, plastic panels of any type are not deformed by moisture. 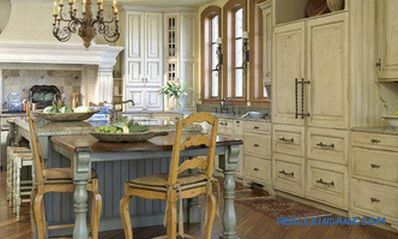 In the case of ingress of dirt, it is enough to wipe the material with a wet cloth, but you may have to re-paint drywall. Even if negligent neighbors make a flood from above, there will be absolutely nothing plastic. 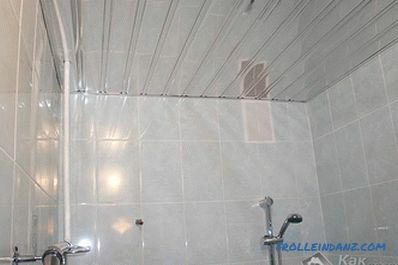 The advantage of plastic bathroom panels is the fact that they do not mold, do not need additional finishing and are easy to replace if necessary. 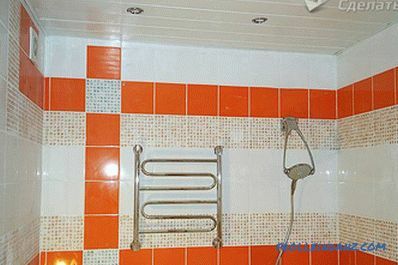 In addition, there is always a wide selection of colors, so that the bathroom will look aesthetically pleasing. 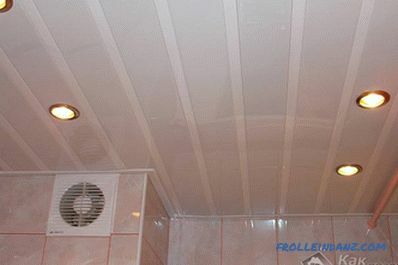 Such panels can close the ceiling with any irregularities and other disadvantages. 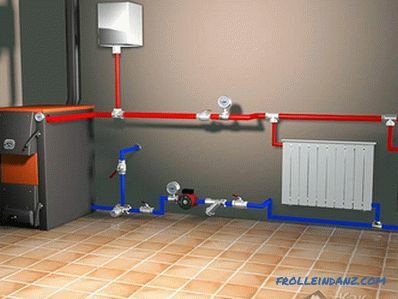 In addition, it does not take as much space in height as a suspended ceiling made of plasterboard sheets, and at the same time electrical panels can be laid over the panels or even hidden pipes. For the manufacture of plastic panels, polyvinyl chloride is used - generally a safe substance for human health, which is also used for the production of disposable plates and other similar products. Before performing marking of the frame and start the installation of the ceiling, you must determine the distance at which the suspended ceiling will be from the floor slabs or the old ceiling. If lamps are installed, then a height of about 100 mm, or even all 150 mm, is necessary. When you have decided on the height, you can start marking on the walls to fix the frame profile. 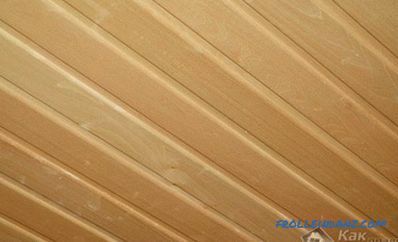 If the ceiling is level (you can check it with a building level), then you can not make a suspended frame, but fix wooden slats directly on the ceiling, and then nail panels with them. How is the markup performed? A mark is placed on the wall in one of the corners, for example, 15 cm down from the ceiling. Then similar marks are put on other walls (using a laser or water level). One continuous line is drawn along them, which will be the level of the bottom of the metal frame. Regarding the profile - two types of profile will be needed - CD and UD. The UD profile is required for mounting on the wall, and the CD as a transverse profile. Count the number of profiles is easy. 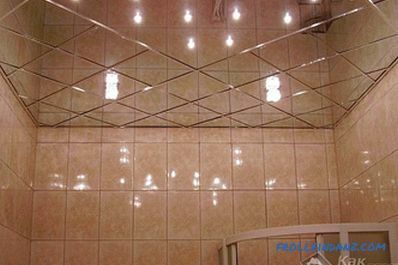 The wall profile has a length of 3 m, which means that it is necessary to calculate the perimeter of the bathroom and divide the obtained value by 3. The situation with the longitudinal profile is similar. It should be located every 50 cm. By counting the total number of axles along which it will be mounted, and their length, you can find out the number of the CD profile in a similar way. Installation of the wall profile is carried out using dowels, and longitudinal - using metal screws small size (the so-called "fleas"). In order to drill the wall under the dowels, you will need a hammer drill or a good hammer drill with a drill with a Ø 6 mm diameter tip. The pitch that secures the wall profile with self-tapping screws must be at least 40 cm. 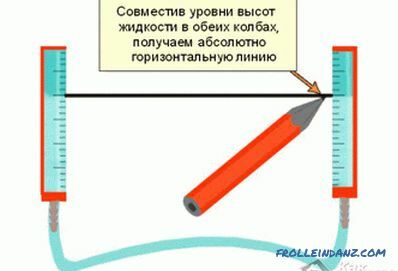 When the wall profile is fixed, the longitudinal profile is mounted, connecting it to the wall one and between them "fleas". 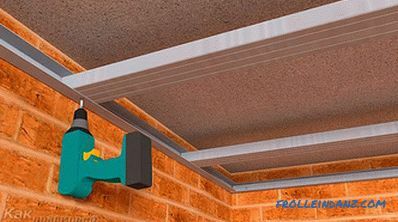 The area of ​​the ceiling will need special suspensions of the spokes or strips, which can be fixed profile so that they do not bend. Given the low weight of plastic panels, they will not need much. 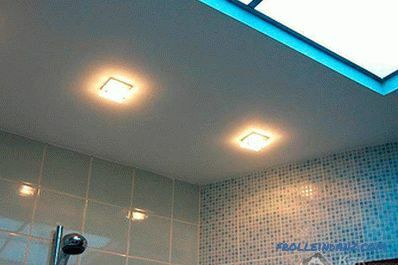 When the frame is completed, do not forget to conduct the wiring to illuminate the bathroom. A copper cable with a cross section of 1.5 mm², made in a corrugation, is suitable for it.Attach the cable to the ceiling, not the frame. At the place where the lamp (or luminaires) will be located, conclusions need to be drawn 25-30 cm long from the frame for the convenience of further connecting the wires to the chuck. For fixtures it is necessary to think of the mount. Now the final stage of the ceiling installation is the fixing of plastic panels in the bathroom. Works always start from the edge. Briefly about the device panels. One side of it has a spike, and the other a groove into which the next panel is inserted with its spike. The first panel is cut along the length (or two panels are attached, one of which will be trimmed) and set with a spike to the wall so that they are located across the frame profile. After that, it is fixed on this profile using small screws with a washer, which are twisted into the spike and the lower part of the groove. After that, insert the next panel, but only the lower part of the groove is fastened in it. According to this principle, the entire ceiling is mounted to the very end. The last panel is cut (if necessary) not only along the length, but also along the width, then it is fixed to the edge near the wall. When all panels are assembled, cornices are glued to the corners with the wall and ceiling, which will hide the seams between the plastic and the wall. 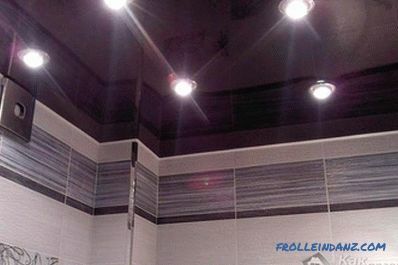 If the plastic panel is typed in length, but its length is not enough for the entire ceiling, then it is necessary to supplement it with a segment of another strip. In order for the joint to be made correctly in this case, it is necessary to purchase a special fastener that has grooves on both sides so that the panel can freely enter in its width. If it is necessary to cut the profile, this can be done with metal scissors. The panel is best neatly cut with a hacksaw or with a sharp construction knife. The finished ceiling can be gently wiped with a damp cloth, after which you need to hang the lamps, fixing them on the ceiling. By connecting the wires to the cartridge, a light bulb is twisted into the lamp. We can say that the installation of the ceiling is complete. 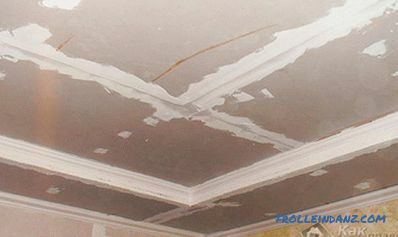 The suspended ceiling made of plastic panels is fairly easy to make, and it is durable - in the next ten years, you need not worry about repairing the ceiling. In addition, performing its installation, you can significantly save on repairs without losing the quality of the work performed. 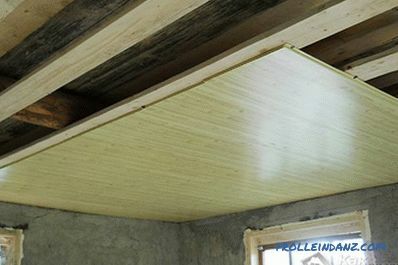 In addition to the panels, you can also install plasterboard sheets to the bathroom ceiling. However, you need to consider that not all sheets will work - in the bathroom you can use only moisture-resistant drywall, which would be able to withstand the increased humidity in the room. 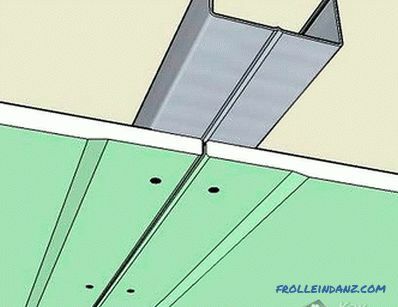 The drywall ceiling is more difficult to install than the ceiling of plastic panels. But its advantage is an excellent design and the ability to create a ceiling of several levels, if the height of the bathroom and its size allows it. So, consider how to begin the installation of the ceiling. In a sense, the framework for plasterboard ceilings is similar to the framework needed for plastic panels. A guide profile is also fastened to the wall, and longitudinal and transverse profiles are attached to it, which are supported on hangers. But there are certain requirements for the step between the latest profiles. Thus, the size of a single sheet of drywall is usually 2.5 m in length and 1.2 in width. 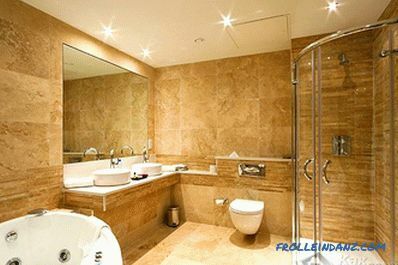 Creating a frame in the bathroom, you need to take into account these dimensions. 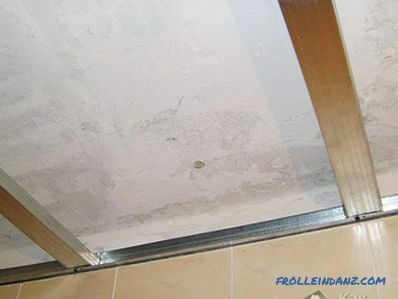 For installing a plasterboard ceiling in the bathroom, some people prefer to purchase non-standard sheets or cut existing ones. In this case, the frame must be assembled, given the size of the resulting sheets of drywall. 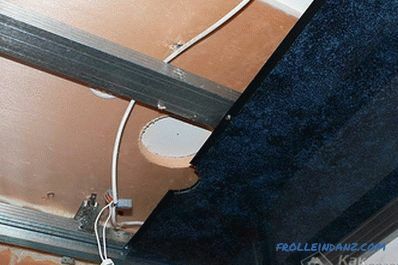 Mounting technology for ceiling plasterboard Sheets on the ceiling begin to be fixed on the edge of one of the walls. Consequently, the two sides of the drywall in length and width will be attached to the guide profile, tightly adjacent to the wall. 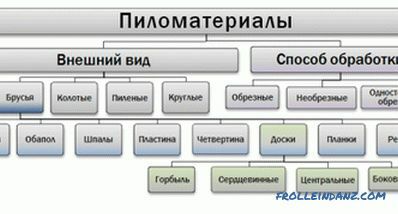 The following profiles are arranged according to this scheme: the longitudinal profile, as well as the transverse one, should only go on the sheet by half, so that the next sheet can be fixed on its second half. 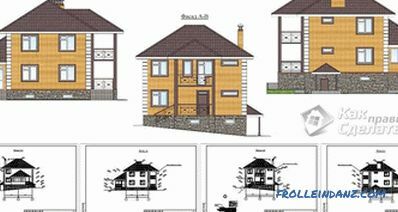 Therefore, the distance from the wall to the center of the profile at the junction of the sheets should be equal to the width of the sheet, that is, 1.2 m, or another value, if the given width has other dimensions. However, a distance of more than a meter without additional amplification is fraught with the fact that the sheet may begin to sag and even crack. 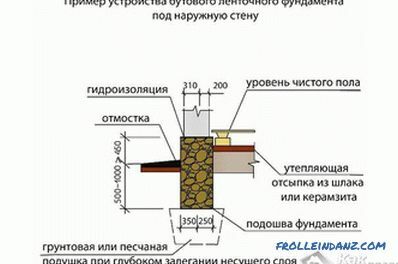 Therefore, it is necessary to fix another longitudinal profile in the middle of the sheet, the center of which would extend 60 cm from the wall and at the same distance from the profile at the junction. In terms of length, the situation is similar. The center of the profile, which will be joined by two sheets, should be in the middle, and between it and the wall it is necessary to place more transverse profiles - approximately every 60 cm (step). The joints of the longitudinal and transverse profiles are reinforced by suspensions.It is possible to strengthen not all the joints, but after one - it will be enough for the ceiling not to sag. By this principle, the entire frame is recruited in the bathroom. In some cases, if the bath is large enough and high, the owners may decide to make a plasterboard suspended ceiling in their bathroom on several levels. In this case, you need to dial the top row of the frame, and then the bottom, while both levels will be connected by a profile in those places where the vertical sections of drywall will be mounted. The optimum height of the level is 10 cm. Before fixing the drywall, you need to lay the wiring, having previously hidden it in the corrugation. Recently, clapboard made of various tree species, such as larch, cedar and other wood, has gained considerable popularity. Besides the fact that wooden lining is durable and durable, and also due to impregnation is not afraid of water. You can mention that it looks good. 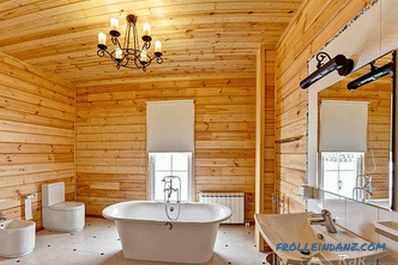 With the help of clapboard, you can create the look that the ceiling in the bathroom is made of perfectly smooth boards. And if you use a raised beam, it would seem as if the ceiling is made of wooden bars. The lining fastening principle is no different from how plastic panels are installed - the clapboard also fits along the principle of "spike into the groove". The only difference is that it is fastened not with metal clips, but with self-tapping screws to the frame made of wood. how to glue ceiling plinth for putty.